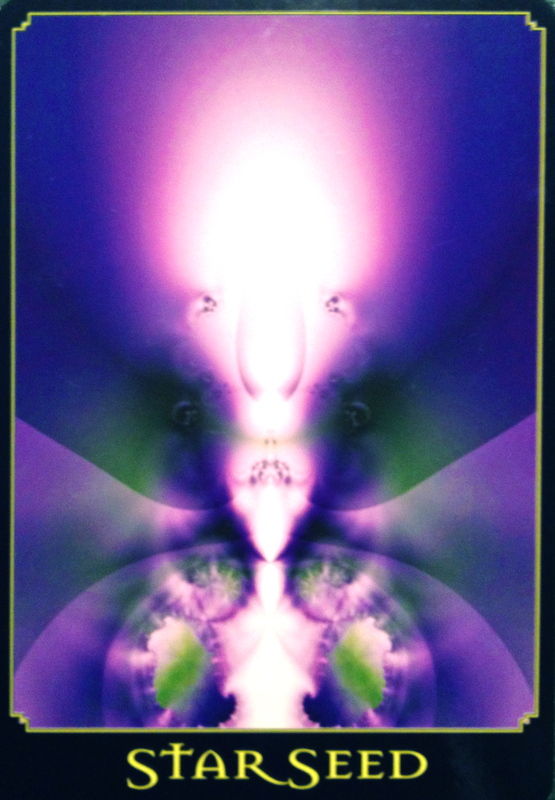 Starseed: “The loving, benevolent being in this card has come to you today to share his worlds of encouragement. There are many who feel as though they do not belong here on Earth. It can be a tough journey, with many experiences and obstacles to overcome. You no longer have to question whether you are supposed to be here or not, or whether you belong. You most absolutely belong here. Your soul has chosen this incarnation for many reasons, and the Universe has brought you here for a reason too. Do not doubt the wisdom of it. You are a very sensitive soul, connected to the subtle energies that weave and ebb throughout the entire cosmos. You may find that you are acutely affected by the moods or thoughts of others as well. Although at time it may not feel like it, this is a gift. It is a special part of your make-up and blue print. Your keen ability to sense and intuit these energies in an aspect of the gift you are here to bring to the planet. You could be any type of healer or teacher, but this largely depends on whether you choose to hide away from the world or to engage in it. At times it may seem easier to just hide away, but that is not what you have come here to do. You carry a high frequency and through your everyday contact with others, you are sharing it. As you allow yourself to open up to the world around you, you will find yourself opening to the higher information and energies as well. As we raise our vibration and our consciousness, we are capable of bringing more Universal Wisdom in from Source. This information is based in foundation of Christ Consciousness; Divine Love. When we are ready, we will become vessels for this information, and we will start, finally to see our true Soul purpose. To choose love. To see the connection in all that is. To teach love and to experience love in every moment. It will be like jumping into a river of light and floating in the Milky Way of love. Bliss. Welcome to the 5th Dimension. Are you ready?